Awesome work mate, all working properly now, just a few extra feature requests, in the order of importance. 1. 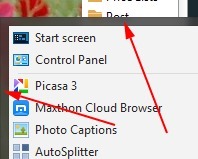 A diferent button image for "Start Menu > Menus > Aero > KeyBoard:TreeView > TreeItem" (The default one would be good) instead of using "Start Menu > Panels > Aero > Top > Programs List > Controls > Programs List Item > Pressed" (then the start menu will be perfect). 2. Support for Taskband TaskItem Buttons "Taskbar & System Tray > TaskBand > Basic > TaskBand > TaskItemButton" IMO Windows 10 style taskitem buttons are complete rubbish. 3. Previous Windows style Themeable System tray background "Taskbar & System Tray > System Tray > Basic > Horizontal > TrayNotify > Background". 4. Previous Windows style Jump List (If present in the msstyles) and functionality (ability to pin more items like in previous Windows) "Start Menu > Panels > Aero > Top > Jump List". 5. Unlocked System Tray Flyout button Width. 6. Previous Windows style Aero Peak (Just because I would love to have it themeable again). 7. Previous Windows style System Tray Flyout (Why did they change it and make it less useful by taking away the customize link area). 8. Ability to have proper functioning Content margins for taskbar clock, "Left, Right, Top, Bottom" at the moment only left and right do anything but even then it will just add both values and center it. Would love to see this implemented again but maybe you could have it only enabled like you have with your Plain 10 style, so instead of making it transparent have it use the background image in which case Plain 10 would still function exactly the same. It should still work if you don't have FILLCOLOR property. Is it possible to have glyph icons without it effecting the places list width, at the moment it increases the width and doesn't respects the values you have in the msstyles? Well glyphs won't fit without adding width. OK no worries, I guess that's true for most, I was looking at some of my styles that already had extra width available that wasn't getting utilised but you are correct with the default SiB start menus so I can see why you made that decision. Thanks Tyhiy, any chance of a fix or maybe a new BETA for ONE as well on the latest insider preview? I noticed the clock properties have changed in the latest builds, it used to be in Taskbar & System Tray > System Tray > Basic > Clock but now it's the same as the taskitem text, Taskbar & System Tray > TaskBand > Basic > TaskBand > TextColor. The only real downside is that now the grey hover background is hard coded instead of an image, is there any chance you could revert it back to Taskbar & System Tray > System Tray > Basic > Clock and make it customizable again and also please add back support for the tray background image in Taskbar & System Tray > System Tray > Basic > Horizontal > TrayNotify > Background. Would still also love to see the Task Item buttons customizable again as well in Taskbar & System Tray > TaskBand > Basic > TaskBand > TaskItemButton.